At approximately 1:30 p.m. today a suspect was contacted by an Irvine resident while climbing through a window to commit a residential burglary on Columbus. The suspect fled on foot and Irvine Police officers actively searched the area, according to the Irvine Police Department’s Facebook page. Irvine, CA – The Irvine Police Department (IPD) has arrested two suspects for committing a residential burglary in Irvine. The suspects are identified as Dominque William Malone, 20, of Lancaster, and Jermaine Edward Toomer, 29, of Los Angeles. A third adult male, age 21 of Los Angeles, is being investigated in this case. Irvine, CA – The Irvine Police Department has arrested two men after they were observed by an officer cutting a lock for a commercial storage container. Sean Anthony Alonso, 26, Irvine, and Justin Andrew Cuen, 30, Paramount, were arrested for commercial burglary and multiple drug offenses. Irvine, CA – The Irvine Police Department (IPD) has arrested four suspects for stealing 17 iPads from an Irvine Target as part of a crime spree spanning three states and hitting 20 California retail locations. The suspects include Isaiah Woods, 21, Sun Valley, Vernon Hill, 20, Ethrata, WA, Victory Rogers, 25, Southwestern Burien, WA, and a male juvenile. They were arrested on charges of commercial burglary, grand theft, conspiracy to commit a crime, and contributing to the delinquency of a minor. They are being held without bail. Irvine, CA – Three suspects have been arrested after two observant custodians observed and reported a commercial burglary in progress. Michael Fairfax, 35, Rachel Fiore, 26, and Patrick Sanders, 51, were arrested on charges related to burglary, identity theft, possession of methamphetamine and drug paraphernalia, and fraud-related crimes. Irvine, CA – The Irvine Police Department is seeking the public’s help identifying a suspect involved in a residential burglary. IRVINE, CA – Three suspects have been arrested for burglarizing an Irvine home. Derron Anthony Jefferson, 26, Quincy Carnell Keaton, 25, and Shatavia Sharon Phillips, 18, were arrested by Irvine Police Department (IPD) officers after a City of Irvine employee observed a burglary in progress. SANTA ANA – A construction company foreman was convicted and sentenced Friday for defrauding employees of $330,000 in wages and keeping the money for himself from two public works contract. 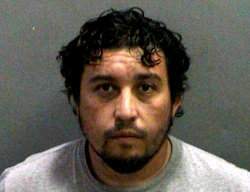 Antonio Naranjo Jr., 41, Costa Mesa, pleaded guilty Friday, March 20, 2015, to 11 felony counts of taking and receiving a portion of a worker’s wage on public works project and two felony counts of recording a false and forged instrument. He was sentenced to four years and six months in state prison. Naranjo Jr. is currently serving two years and eight months in state prison for a residential burglary conviction in 2012 (Case #12HF3186) and will now serve seven years and four months in state prison. Co-defendant and construction company owner Mustafa Mohamed Bdaiwi, 43, Irvine, is charged with 11 felony counts of taking and receiving a portion of a worker’s wage on public works project, 10 felony counts of willful failure to pay tax, four felony counts of misrepresenting facts to state compensation insurance fund, two felony counts of recording a false and forged instrument, and sentencing enhancements for property loss over $200,000. If convicted on all counts, he faces a maximum sentence of 21 years in state prison. He is out of custody on $2 million bail and is scheduled for a preliminary hearing tomorrow, March 24, 2015, at 8:30 a.m. in Department C-55. IRVINE, CA – Just before 3:00 a.m. Irvine police officers responded to the report of a burglary in progress on Winterfield. Arriving officers spotted the suspect, 19-year-old, Matthew Kozlov of Anaheim Hills, leaving the area. Kozlov fled, running through several neighboring properties and was ultimately found hiding in a nearby backyard and was arrested without incident.